It looks like Epic's Cliff Bleszinski was more than just three days off when he told Jimmy Fallon on national TV that Gears of War 3 was hitting on April 8. The next day Microsoft shifted the date a bit, saying the game would actually be hitting on April 5, 2011. Today the publisher is shifting Gears 3 a bit more... to the fall of 2011. And they say the, let's just call it a delay, has nothing to do with development time and everything to do with marketing. 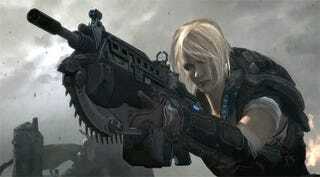 "Gears of War 3 promises to be the biggest entertainment launch of 2011," the Microsoft statement reads. "The teams at Microsoft Game Studios and Epic Games have done great work thus far readying the title for release in the Spring of 2011. However, we've elected to move the launch of Gears of War 3 until Fall 2011 to make it the marquee title for the holiday season." Fair enough. But why would they decide now, just a week or so into fall 2010, to push such a huge title back five or so months? Microsoft declined to say, so let's speculate. If it is indeed purely about marketing, there are a couple of things that could be at play here. Epic's other big game, Bulletstorm, is set to knock us off our feet on Feb. 22, 2011. Maybe they wanted to give that a bit more breathing room. And what about the other huge Xbox 360 shooter exclusive, Halo? Maybe this oddly timed redeployment of Gears of War 3 was somehow spurred by the inner machinations of that still untitled, undated, relatively unknown Halo game by 343 Industries. We'll probably never know, but isn't it fun to ponder?